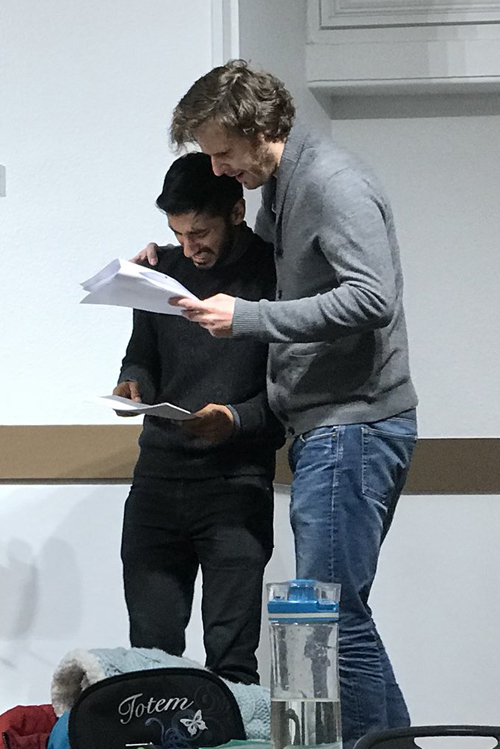 On 19 February, Rupert took part in a ‘table read’ for Sky Drama of Unicorn, a sitcom script written by Ria Lina and directed by Chloe Thomas. … Judging by the photo, it looks like my kind of thing! Tweet from Ria Lina including the photo. Related Tweet from Chloe Thomas. Can’t wait for friday’s read for Sky. Great cast @selgriffiths, @RupertFYoung, @HarkiBhambra & team @paulkerensa, @brazenprods and @chloejocasta. Here’s a pic from rehearsal. Yes, I scripted the guys hugging each other instead of me.